Family literacy refers to the many ways families develop and use literacy skills from enjoying a storybook together, playing with word games, writing to a relative or friend, sharing day-to-day tasks (such as making a shopping list or using a recipe), and surfing the Internet. Researchers estimate that over the lifetime of participants in an early literacy intervention program, returns to the public are $7.16 for every dollar invested. That sounds like a pretty good return! The National Center for Family Literacy's long-term research with 2,000 families shows that literacy intervention reduced participants' full dependence on public assistance from 67% to 11%. Children have a better chance of becoming fully literate adults if reading is encouraged in the home. Executive Women International is committed to promotion of literacy, our corporate philanthropy focus since 1992. EWI Chapters across North America have enlisted the aid of corporations, writers, teachers, and many others to promote reading and writing opportunities to children. Projects vary from chapter to chapter but all with the same goal, to make a lasting and positive impact in our communities. Reading Rally events are one of the ways EWI promotes literacy in the community. Throughout the years, these events have enriched lives by gaining knowledge, and making a difference in today’s youth. It has made a difference for more than 17,000 children. Our Calgary EWI community involvement also donates thousands of dollars in scholarships awarded annually to local recipients from our endowment fund at the University of Calgary. Funds are also used to purchase research materials, seminars, and books from our programs at Alberta Heart and Stroke Foundation and Calgary Health Trust. The excitement and the thanks we got from Highbanks residents when the Book Nook was finished. 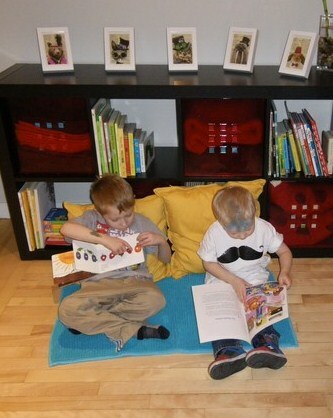 See the kids plopped down on cushions immersed in the storybooks. The look on the 2011 U of C recipient, Stephanie Sands face when she was presented with $1,500 and then presented with another surprise $500.00 from EWI to help with tuition. See the disbelief and gratitude on Dengli Zhang’s face when she accepted the $2,500.00 EWI Calgary contribution to the Adult Students in Scholastic Transition (ASIST) in May 2013. Her name was then forwarded to EWI Corporate and became eligible for another $2,500.00 or the grand prize of $10,000. Unfortunately she was not the winner of this year’s award, but maybe our next year’s applicant will! See Kayla Popp, our U of C endowment scholarship winner in December 2013. With tears in her eyes she said “I don’t think you realize how much of a difference your $2,500 has made in my life”. Small things do make a difference. Please join us in supporting our literacy philanthropy efforts, and feel what I feel, watching the recipients, every time.